I thought yesterday’s Winter Botany Quiz #6 would be a fairly difficult, and given the apparent difficulty of my previous quizes (Pismire Puzzle and Tuesday Teaser) I thought I’d give readers a break this week and narrow down the location to the Lake Tahoe area. Despite publishing in the dead of night, it took only 31 minutes for Peter Yeeles to swoop down and correctly name the family, genus, species, and function for the structure pictured. His only lapsus regarded the terminology used for the name of the structure itself, leaving the door open for James Trager to snag some scrap points. 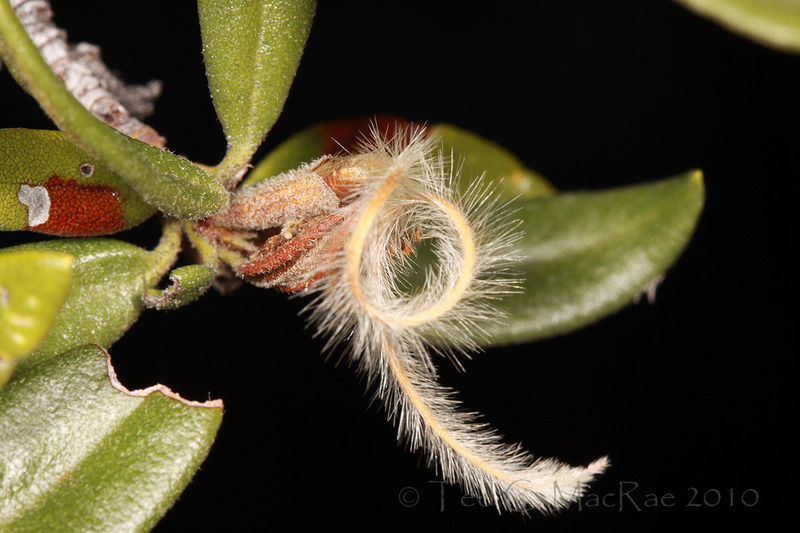 The plant is, of course, Cercocarpus ledifolius (curl-leaf mountain mahogany) in the family Rosaceae, and the structures pictured above and in the previous post are the stigmas of the flowers persisting as wind-assisted dispersal structures for the fruit. “Cercocarpus” is, in fact, derived from the Greek words for “tailed” and “fruit”, whose numerous erect hairs give the plant in a silvery sheen late in the growing season. Why was I interested in this plant? 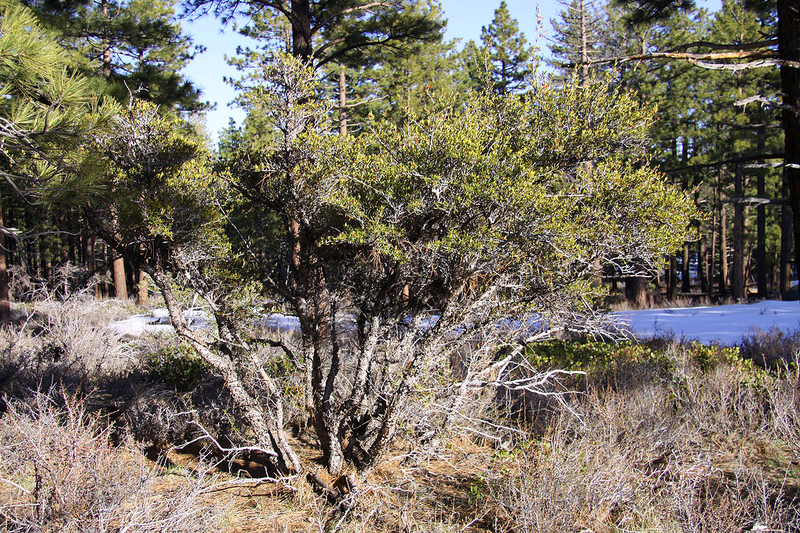 It was one of the few tree species occurring in the Lake Tahoe Basin that I wasn’t able to find for last year’s 3-part series, Trees of Lake Tahoe (including The Pines, The “Other” Conifers, and The Deciduous Trees). Widespread in the mountainous west (and barely qualifying as a tree), its occurrence in the Tahoe Basin is more sporadic. Better stands are found outside the basin proper on the dry eastern flank of the Sierra Nevada (Graf 1999), and indeed these plants were photographed at ~6,500 feet on the eastern slopes of Mt. Rose. My real interest in Cercocarpus, however, is as a favored host plant for species of jewel beetles (family Buprestidae). About two dozen species of these beetles have been associated with Cercocarpus spp. in North America, nine of which have been confirmed as breeding within dead branches of these plants and five having been associated with no other plant. I’ve collected a number of these species myself, particularly in the San Gabriel and Santa Rosa Mountains of southern California and the Chisos Moutains of Big Bend National Park in Texas, including Polycesta cazieri, Chrysobothris piuta, and paratype specimens of Acmaeodera rubrocuprea. I thought it might be of interest to any readers who might collect these insects to present a checklist of Buprestidae associated with Cercocarpus in North America (see appendix below). Graf, M. 1999. Plants of the Tahoe Basin. Flowering Plants, Trees, and Ferns. A Photographic Guide. California Native Plant Society Press, Berkeley, 308 pp. (Bold indicates species that have been reared from Cercocarpus. An asterisk indicates species that have been associated exclusively with Cercocarpus). This entry was posted in Coleoptera, Rosaceae and tagged beetles, Botany, entomology, insects, jewel beetles, Lake Tahoe, Nevada, science, trees. Bookmark the permalink. Interesting Ted. There’s a fair bit of Cercocarpus betuloides scattered around my brother’s place near Mariposa at 3,200 feet. Might have to do a little collecting on it to see if anything interesting is around. “Sneaking up” on dead branches within living trees will give you the best shot at seeing any of these beetles if they’re there. They tend to “dodge” to the backside of the branch if they spot you and will zip away in a flash once truly alarmed. They’re out primarily in June. Just Google some of the names to get an idea of what they look like. Ah – I know that trick – the local cicadas use it too. I’ll poke around when I’m up there in June. I’ve been really keen to find some of the bigger Buprestids since I’ve been up in the tropics, but to date they have continually eluded me. There are some cracking species up here, the big “living jewels”. Heading through the Daintree for a couple of weeks, in 2 weeks time.. if all goes to plan I will come back with pics of some impressive Cerambycids and I might FINALLY see one of these mythical Buprestids! You must be talking about Calodema and Metaxymorpha – yes, those have to be among the most impressive of all buprestids. I know a few buprestid specialists in Australia – they might be able to give you some precise localities. If you ever get out to western Australia there are some unbelievable species in the genera Temognatha and Stigmodera, not to mention a bazillion smaller yet equally colorful species of Castiarina (the ecological equivalent of our Acmaeodera). Excellent species:host list. Thanks for the post, Ted. Hi Delbert – you’re welcome, and thanks.